I dedicated half of September to re-reads, while I kept Mariana company during her Re-reads Month and really enjoyed reading loved/favorite books. My biggest problem was choosing them. An interesting note: I noticed that most of my comfort or favorite books are in the "B" category (B, B+) -- yes some of them are A's, but very few. Does that happen to you? And finally I do have Challenge Updates this month. After four months of not reading or reviewing any books for the In-Death Challenge, my block was broken and I'm again on a roll again! I also finally began reading the book I chose for Orannia's BIG BOOK Challenge, Naamah's Kiss by Jacqueline Carey, and *drum roll* I finished reading and next week will be posting my last review for Anasthezea's 2010 M/M Romance Challenge. Yes! Favorite book AND Biggest Surprise this month? I know this is an older book, but I've been looking forward to reading it for quite while -- it took me all this time to find this old copy and purchase it. 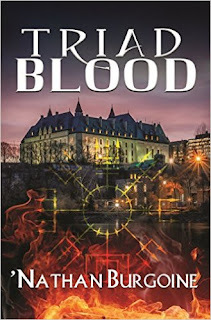 The first three books in Fiona Brand's SAS series are favorites and I just expected more from this one, and you know what those high expectations can do. Brand still weaves a good story and I enjoyed some parts of it, however in my opinion this book was definitely not in the same category as the first three in the series. You can read my thoughts here. How was your September? What book was your favorite? I chose an "oldie, but a goodie." Was yours an "oldie," or a new release? Welcome back Hilcia. You sounded relaxed! I won't be able to take a time off until December. I'm currently in between deadlines and family events and readings and finals and all! I think some comfort reads are comfort reads because of certain parts/characters of the story but we don't love everything in the book. We love those parts enough to overlook the parts we don't love which equals the B grades. LOL, most of my re-reads are favorites and as such, I'm completely biased and so they are As LOL. Very good month for you, Hils! So, are you planning to read more of Jennifer Crusie?!? I'm really looking forward to your review of Truly, Madly!! Leslie, I think you're absolutely right about those comfort reads and/or re-reads -- at least some of them. Enjoy Jamie and Claire, I still need to pick the last book in that series. Nath, lol! I feel that way about some books... they are As no matter what. :D I am DEFINITELY reading more Crusie books, I've already downloaded some samples of other books through my Kindle account. Now I have to choose my next read. I liked Truly, Madly! I did! Some really great reads last month. I'm SOOOOO happy that you liked the Crusie. Bet Me is another favorite of mine - and a lot of other people too.